Is NGT panel’s attack on AOL rooted in Secularist malice and mediocrity? This article delves into the political skullduggery surrounding the artificially manufactured environmental controversy by NGT against AOL. The National Green Tribunal’s assessment that the World Cultural Festival conducted by the Art of Living Foundation in March has resulted in the “complete destruction” of the Yamuna floodplains is steeped in absurdity, incompetence, and malicious intent. This article delves into the incompetence, and the political skullduggery surrounding this artificially manufactured environmental controversy and analyses the information culled from Indian media reports, which unveil a hidden, bigger picture of malice, mediocrity, and victimization, which should be of concern to all those who wish to see India achieve its full potential. The NGT-WCF environmental controversy is a calculated sequel to the efforts that were made to scuttle the World Culture Festival even before it began. Anyone even remotely acquainted with the state of the river Yamuna in Delhi knows that years of unchecked greed, corruption, abuse, and neglect has left the river and its entire ecosystem thoroughly devastated. For decades, authorities and even the so called environmental bodies and activists have looked the other way as uncontrolled environmental pollution, land encroachments, sand mining, untreated sewerage discharge, dumped garbage, slum clusters, unauthorized agricultural activity, and illegal pucca colonies have steadily degraded the river and eaten up the flood plain. Colonies with names like Rajiv Nagar, Sonia Vihar, Usmanpur, Abul Fazal Enclave, Shaheen Bagh, etc. suggesting the patronage of certain influential “secular” political parties have been allowed to mushroom on the encroached flood plain over the years. It is thus bizarre that a 3 day open-air international music-dance-meditation festival that brought people of different geographies, languages, cultures, races, nationalities, and religions in unity to celebrate peace, yoga, meditation, human values, respect for nature, and cultural diversity and which highlighted various indigenous and tribal art forms of the world has been unscientifically deemed fatally devastating to the Yamuna floodplains by the NGT. What this shows it that in the NGT’s worldview, secular encroachments and constructions need to be given a free pass, but a temporary event like the World Cultural Festival designed to create a worldwide paradigm shift towards non-violence and towards the yogic sciences and arts of mindfulness and consciousness should be selectively and illogically targeted. One of the objectives of making the Yamuna the site of the festival was precisely to refocus the attention of the nation on the fact that the river Yamuna needs urgent healing, but when failed agencies and political proxies like the NGT make the AOL Foundation their scapegoat, real historic factors like illegal land grabbing under secular political patronage, public apathy, indifference of public authorities, and societal callousness go unaddressed. These issues require comprehensive and neutral sustained will and effort to tackle, which the NGT has been incapable of demonstrating ever since its inception. If the NGT were to do its job effectively, the Yamuna would not be reminiscent of a dirty drain as it is today. The awful smog enveloping all of north India every winter would not be recurring with sickening regularity. The NGT has failed to take any meaningful action that reduces the emission of harmful pollutants into the atmosphere, but more of this later. Not only has the NGT just been content with issuing ritual sermons from its privileged ivory towers without engaging the authorities on the ground to make a meaningful difference in the quality of the environment, but it has also issued controversial and disruptive directives with the potential to derail India’s new efforts to create a secure economic future for all its people through faster and higher economic growth. Attempts are being made to subvert the efforts to modernize and fast track India’s growth and progress, and the NGT is being used as a convenient tool, as we will discuss later in this article. As mentioned earlier, one of the objectives of making the Yamuna the site of the festival was precisely to refocus the attention of the nation on the fact that the ravaged river Yamuna needs urgent healing. The Art of Living has done commendable work in the country in the areas of ecology and environmental stewardship, inspiring volunteers to plant hundreds of thousands of trees in various plantation drives. In recent months, its volunteers have revived numerous disappeared or dying rivers in 3 parched Indian states — 22 of them in Maharashtra alone. If there is any volunteer driven organization that has had such a huge positive impact on the protection of rivers in India, it is AOL. The World Culture Festival brought a lot of prestige to India and generated a significant amount of interest worldwide in three of India’s greatest civilizational gifts to the world – yoga, meditation, and the noble concept of Vasudhaiva Kutumbukam (loosely translatable as “all of humanity is but one big family”) – civilizational gifts that have the potential to change a world presently driven by racial and religious violence and hostile divisions. While the vacant sandy flood plain was probably the only place in Delhi, where the expected 3 million visitors could be properly accommodated for an event of such global importance, Sri Sri Ravi Shankar deserves much praise and due credit for organizing the Word Culture Festival along a dead and stinking river in an attempt to revive the collective memory of the cultural significance of the Yamuna and bringing attention to the current plight of a holy river so central to the Indian consciousness. 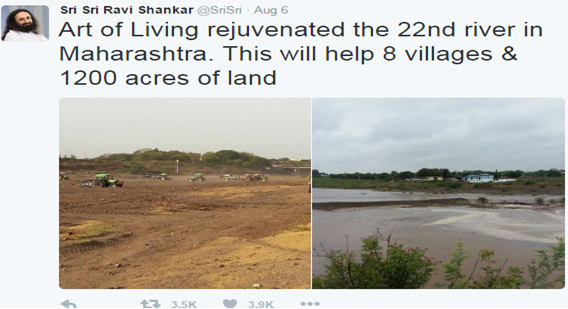 Till the Art of Living started work on the WCF, the floodplains were being used for illegal activities. In fact, the Delhi police acknowledged that the floodplains had been a law and order problem for them and appreciated that they had been cleared of anti-social elements since the WCF. The truth is that World Culture Festival did not damage or pollute the Yamuna floodplains or the so-called wetlands. The claim that it did so is a distortion of facts and unsupported by objective or scientific assessment. Floodplains are large tracts of land that are spread over thousands of acres. 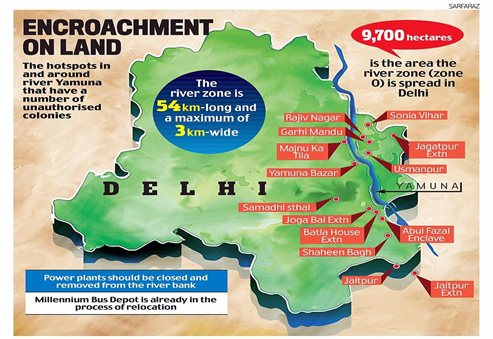 How much of the Yamuna floodplain was used by the WCF? A tiny portion – less than 1%. How could that “completely destroy” the Yamuna floodplain? The land allocated for WCF is neither a wildlife sanctuary, nor a reserved nor designated forest protected by preservation orders. It is not even a notified area. Had it been so, AOL would not have applied for it or been granted permission. Work on the WCF began only after AOL had received all permissions necessary from the Delhi Development Authority (an autonomous civic body that is the custodian of the land along the Yamuna floodplain) and other relevant agencies of the State and Central governments. The organizers were careful in ensuring that the event adhered strictly to the Delhi Pollution Control Committee’s advisory notes. No permanent construction was done, no permanent structures were erected. Not a single tree was cut. When AOL received possession of the allotted land, it was filled with malba, dumped on the floodplains by construction companies. AOL volunteers cleared truckloads of malba for a month for the grounds to be usable. Even to clear the malba, permission was taken from the DDA, and the cost was borne by AOL. Far from harming the environment, AOL left the place cleaner and greener than before. AOL volunteers prepared an eco-friendly enzyme formulation from kitchen waste which was used to clean up the drains at the Yamuna which had an unbearable stench. After this process, the stench was completely gone. Photographs of the core area where the stage actually stood, taken on April 17, show the grass growing again, which discredits the false accusations made by the NGT. Pictures taken on the same date show Australian and migratory birds, ducks, buffalos and cows coming to the area, which was not the case before due to the stench there before the festival. Just by removing tons of older malba, AOL has performed great service to the city of Delhi and the river Yamuna. Blaming the World Culture Festival for imaginary damages to the Yamuna and its littoral betrays an utter lack of understanding of the larger ecological issues afflicting the environment of not just the country, but also the rest of the planet. While intellectual lethargy of the bureaucratic kind tends to fix blame on an easily identifiable entity as opposed to digging deep to address the complex web of issues that impact an ecosystem, there seem to be more insidious motives at work in this case. The Art of Living has challenged the claims of the NGT. Several legal and environmental experts are now coming forward calling the NGT’s Expert Committee’s report fraudulent and unscientific and have rubbished the committee’s report as prejudiced and biased. The Art of Living has made public documentary evidence that points to the mala fide and premeditated intention of the NGT committee to malign it, including a letter by the Chairman of the Expert Committee, Mr. Shashi Shekhar, written to the Chair of the NGT in which he acknowledges that the “random figure of Rs.120 crore demanded as compensation was an “inadvertent mistake,” “was not based on any scientific assessment,” “did not have any scientific basis,” and was due to the fact that he “was running high fever” and “could not see the entire report prepared by the experts” (sic). The documentary evidence furnished also discloses the previous collaborations and close connections between the petitioner Manoj Misra of the Yamuna Jiye Abhiyan (YJA) and NGT expert committee member and former JNU professor Brij Gopal — both of whom had earlier worked together to block the Indian government’s interlinking of rivers project and many other similar projects. Further, the business and collaborative history between the YJA and elements in the NGT raises many ethics related questions and represents a grave conflict of interest that requires further examination. “I went to see what YJA does for betterment of Yamuna. The YJA is run by peace institute. The website was defunct. Tough luck! 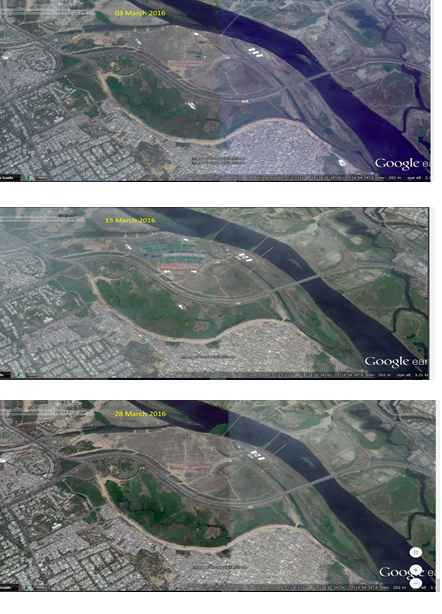 So I saw their blog and Facebook page to get a sense of their contribution to Yamuna Cleaning. By their blog and Facebook, I figured out that their activities can be classified into workshop, river walk, trip around river, protest march, taking picture of garbage, and yes…writing letters, petitions & articles, giving talks and filing cases. There was no photo or article of river cleaning in last 5 years!!! 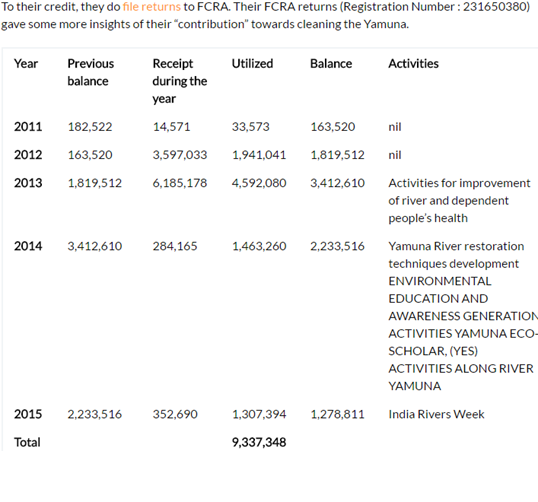 Not a single event where YJA has actually cleaned the Yamuna river bed. The Opindia article reveals the true nature of some of these NGOs and the parasitic ancillary cottage industry of shady activism they partake in with the easy money that they procure in the name of the river Yamuna / the environment – all without bringing about any iota of tangible benefit to the river and the environment. The article also states that after the conclusion of the WCF, leading environmental scientist, Dr. Rakesh Kumar from NEERI (National Environmental Engineering Research Institute) had affirmed that the WCF had not damaged the Yamuna plain in any tangible way, but the aforementioned NGO and the media had ganged up against him, questioning his ability to assess ecological damages as he was not an environmental expert but an environmental engineer. Interestingly, the article in turn similarly questions the expertise and credibility of the YJA’s founder and head Manoj Misra, pointing out that the YJA is run by someone who is just a “wildlife expert” himself. “effective and expeditious disposal of cases relating to environmental protection and conservation of forests and other natural resources including enforcement of any legal right relating to environment and giving relief and compensation for damages to persons and property and for matters connected therewith or incidental thereto. It is a specialized body equipped with the necessary expertise to handle environmental disputes involving multi-disciplinary issues” (sic). The NGT is part of the apparatus set up by the UPA, when they were in power. It is a feather in the plumage of the same bird. Read the news article Sri Sri Event Sees Opposition Unite Against Government to see how the opposition, led by Congress leader Ghulam Nabi Azad, targeted the Modi Government over the WCF in the Parliament, using the farcical and pathetic excuse of “environment, biodiversity and ecology.” After the failure of the fabricated “intolerance” issue, we now risk seeing more of “environment, biodiversity and ecology” as ammunition for defaming Modi and India. The NGT will be used as the cannon. The UPA government, after all, was also known for its massive financial scams, each involving crores of rupees across sectors ranging from telecom to coal mining. The NGT, by demanding a fine of rupees 120 crores from AOL seems to be carrying forward this tradition of greed and hunger for crores of rupees and of arrogating and misusing power. The huge fine amount (120 crores or 1.2 billion rupees) seems to be designed to completely destroy the Art of Living Foundation and to make it unable to do the work it is doing to preserve and revive indigenous Indian knowledge and spiritual culture. Sri Sri Ravi Shankar has courageously decided to take a stand and fight against the prejudice and injustice in this matter. “For the last few days, a new issue has emerged out of Media which has been given a great emphasis. Hindu Guru Sri Sri Ravi Shankar’s much talked about “World Cultural Festival” is happening in Delhi and the place at which this festival is organised is at the Banks of Yamuna. A lot of Hue and Cry has been made because the event is happening on the banks of Yamuna by giving the logic that it will be disastrous for Yamuna, It will ruin the ecology. Hundreds of articles have been published and tons of TV debates happened on the issue. As soon as the religion changes, and Christianity comes in the picture, all these Media crooks get silent. 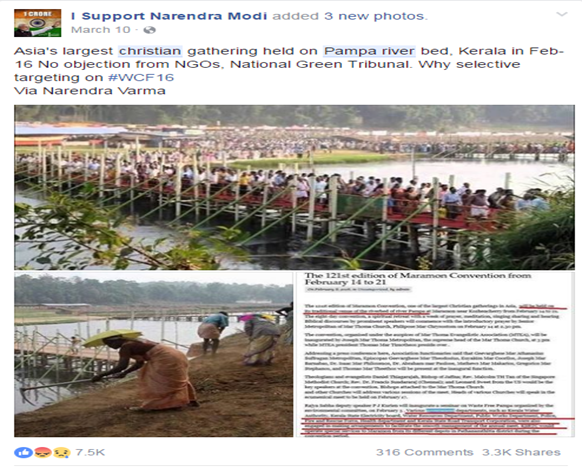 Asia’s biggest Christian meet “Maramon Convention” happen every year in Kerala on Pampa Riverbed. 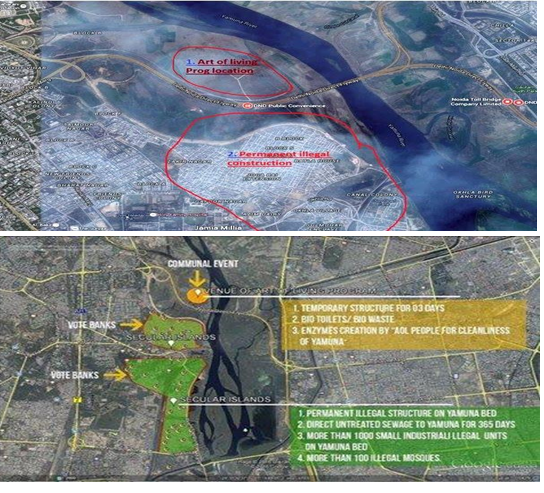 See the pictures below showing the construction happening and usage of the river. The National Green tribunal or the NGT has proven itself to be not just discriminatory and Hinduphobic, but also as inept, unscientific, and immature in the way it has handled several major environmental issues. The ill-advised and unscientific ban on diesel vehicles is another example of half-baked thinking, where real threats and dangerous sources of particulate air pollution are ignored. Not satisfied with just the NCR, the NGT was also contemplating extending the ban to 11 other cities. The negative impact this ban has had on business confidence has been as strong as the impact on the environment has been ineffectual. The NGT’s track record in being judicious and prudent stands to be highly suspect, even otherwise. Is the NGT “throwing a spanner” in the development of India?” is a question that is being asked in many quarters today. The Firstpost article dated August 12 alluded to earlier has a section devoted to this question and presents instances of such cases to which readers can refer. It is clear that the NGT has completely failed to do its proper duty as an environmental watchdog. Here is something interesting, which reinforces the idea that the WCF may have become a symbolic site for the larger secularist subversion of nationalist efforts to build a new, culturally-proud, resurgent India: PM Modi, who was present at the inauguration of the WCF told Indians, in his speech, to be proud of their cultural heritage, while President Pranab Mukherjee, a former Congress politician, who had always been affiliated with the secularist UPA, ended up not attending at all — because of which even other heads of state withdrew from the event — even though Mukherjee had earlier agreed to attend the valedictory ceremony. His office cited “unavoidable circumstances” for backtracking and giving the function a miss, while certain sections of the media were making sure that the word got out that Pranab Mukherjee had bailed out due to the emerging environmental controversy. The number and the kind of news items that were being spun out by the secularist media houses during that period suggest that the WCF may have intentionally been made controversial by certain vested interests to turn it into another localized site to carry out the broader subversion of India. Another piece of news has now emerged that fits into the pattern and shows how the NGT is being misused as a tool to provoke economic disruption in India. Business Standard has published, on September 1, 2016, a startling news report revealing that NDTV (New Delhi Television, a channel with close connections to the UPA) filed a petition with the NGT in 2015 to stop the Modi Government’s Sagarmala Project, which involves the modernization of existing ports and the building of essential new ports to boost India’s growth, development, and trade. The development and expansion of India’s new port system is seen as essential for creating new and sustainable economic and employment opportunities for India’s youth, who are entering the workforce in the millions each year. “In its petition before the tribunal, the company that runs one of India’s prominent bouquet of TV news channels, has asked for work to be stopped on all new ports of the country, till the tribunal gives a decision on the case to the coastal environment and livelihoods of coastal communities. NDTV has contended that the innumerable ports being planned across the Indian shoreline could be dangerous for coasts and authorities should make a carrying-capacity assessment before going ahead. As Business Standard reports, “NDTV has made the ministry of shipping and the ministry of environment, forests & climate change respondents in the case along with the port authorities of 11 states and Union territories that have a coastline.” One wonders if they showed this kind of concern for fishing communities and coastal and maritime ecology, when UPA was planning the Sethusamudram shipping canal project involving the destruction of delicate corals as well as the limestone shoals of Adam’s Bridge/Ram Setu? The attempt to totally block Modi’s Sagarmala Project, an infrastructure project so central to India’s future development and to the success of the “Make in India” initiative is a move that has the potential to sabotage India’s economic trajectory and stall vital development. Observers have opined that this is a channel that was very much at the forefront of the negative mediatized spin given to the WCF in the attempts to stop Sri Sri’s World Culture Festival. The proxy relationship between the NGT and NDTV clearly predate the WCF and seem to have become particularly salient after Narendra Modi’s rise as India’s Prime Minister. The inexplicable vindictiveness of the NGT towards the Art of Living may be stemming from this politics of covert subversion that the Indian nation and the Modi government seem to have faced, since coming to power from the elements with allegiances to the ancien régime of the UPA. It is therefore in the national interest that the misguided and mala fide designs of the NGT and the YJA be thwarted. The Art of Living should not pay the ridiculous fine, and the responsible elements in the NGT should be investigated for their fraudulent report and malicious intent. Investigations into the sources of funding of various NGOs operating in India should also be pursued — with more vigor. Media houses and TV channels should also be brought under the purview of such investigations. Shonu Nangia is an academic, linguist, and translator-interpreter by training and works as an Associate Professor of Foreign Languages at LSU-Alexandria (USA) where he teaches French and Spanish. His scholarly work has appeared in Electronic Journal of Foreign Language Teaching, Michigan Academician, Folia Linguistica et Literaria, The Journal of College Writing, Louisiana Communication Journal, and a host of other places. He is also the author of the book Male-Female Relations in the Literary Maghreb: Poetics and Politics of Violence and Liberation in Francophone North African Literature by Tahar Ben Jelloun. He also enjoys organizing film festivals and yoga and meditation workshops. Christian missionaries: Who are Hindus dealing with?